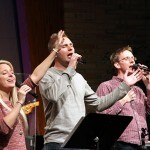 I was blessed to lead worship with my good friend Nate Anderson, Liz Johnson, and many others at the 2012 Adoration Conference at Emmaus Lutheran in Bloomington, MN. With that, I’ve been realizing just how important corporate times of worship are, and not only that, but how important it is to prayerfully and wisely select songs for the church. Singing corporately not only allows us to praise God together and to put the language of music to use to express our gratitude/wonder/joy/anger/sadness toward God or whatever situation we’re in, individually or corporately, but also allows us to declare what we believe, sometimes without even realizing we’ve done it. Before we had even made it to the announcements we had already declared our belief in these things through the words of the songs that we had sung together! 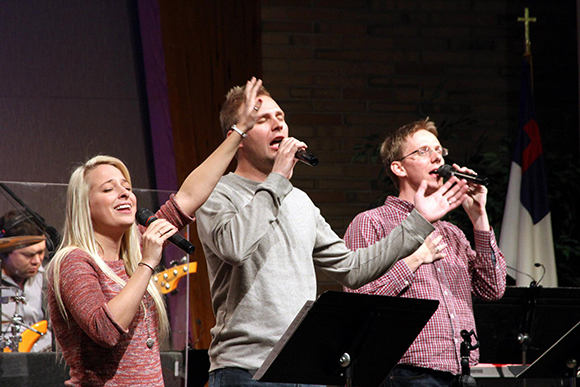 If you are a member of the congregation but not actively involved in service planning, make sure you view the times of congregational singing as more than just “times of congregational singing.” Pay attention to the content of the songs your congregation sings. What are you declaring? 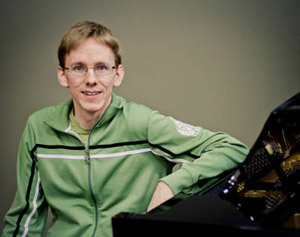 Worship leaders and planners, make sure, as you plan your weekly worship services, that your congregation is getting equipped with a musical language that not only expresses a heart’s desire to worship God, but that also forms and shapes the faith of the people into Christ’s likeness. Question: What lyrics from songs you’ve been singing in your congregation have helped to form your faith recently? And here’s a quick little bonus: a blog post for Living Word that shows just how much we’ve confessed through song in the last six months. It was a blessing to me to see what we’ve been declaring together through song!